The FM4000 Radiotelephone is a rugged, reliable 1 Watt and 25 Watt radio with built-in DSC functionality built to withstand the harshest conditions that may be encountered at sea. Its compact, waterproof case design allows a simplified installation on any steering console, helm or flybridge. Dedicated control buttons and a rapidly operated rotary channel selector offer easy access to all U.S. and international marine VHF channels. Instant Channel 16 access, up-to-date marine weather reports on 10 different channels and other advanced features are at your fingertips. 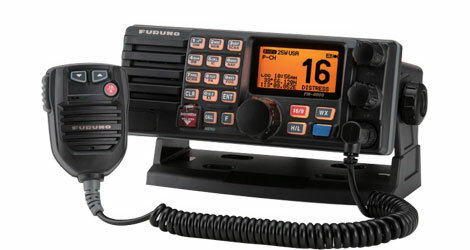 FURUNO FM-8800S Marine Radio is a high quality, all-in-one marine VHF radiotelephone designed to comply with the GMDSS carriage requirements for safety and general communications. All the necessary functions such as a 25 W VHF radiotelephone, a Class A DSC modem and a CH 70 Watch Receiver are incorporated into the compact transceiver unit. The SAILOR RT2048 VHF is a true workhorse, which has for many years been the preferred choice for seamen all over the World. Its compact metal cabinet houses transmitter, receiver and a 6W loudspeaker with clear and powerful audio. The robust push buttons are night illuminated and the large LED channel display allows easy read-out under all conditions. As a result the SAILOR RT2048 VHF is as easy to use as it is sturdy. Designed and developed on the long tradition of SAILOR VHFs, Thrane & Thrane is proud to introduce the new SAILOR RT5022 VHF DSC. The new SAILOR RT5022 is a serious and reliable choice for the professional seaman, fulfilling and even exceeding GMDSS requirements. As the first VHF ever, the SAILOR RT5022 can store and replay incoming calls. The bridge being a busy and sometimes noisy place, this facility increases the safety at sea as a missed message just can be heard again.